The affects of communism and the persecution of religion was strongly present in western Hercegovina during the communist years. The Yugoslav Communist party did not tolerate religion and because of this, religious institutions were eradicated if they did not support the communist agenda. 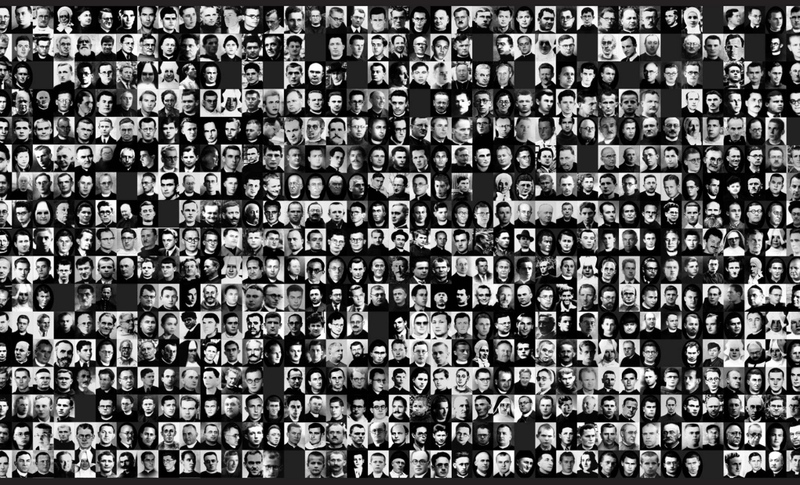 Like political activists, most were jailed, but many were killed. During the Second World War, the losses of the Croatian people were immense. 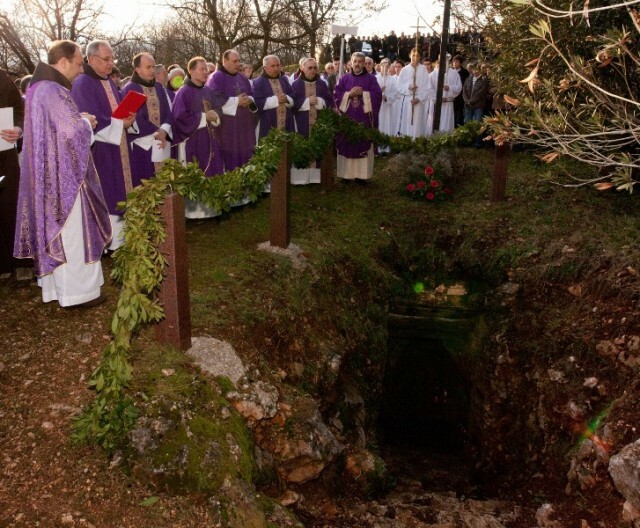 300,000 Croatian civilians and soldiers lost their lives at Bleiburg at what is called the “Way of the Cross” (Put Križa). It is estimated that over 500 Croatian Catholic priests and nuns were killed by the hands of the communist party. 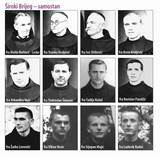 66 of those killed were franciscans from the province of Hercegovina (Hercegovačka Franjevačka Provincija). The words “They killed the priests!” (Pobili su pratre!!) echoed through the mountains of Hercegovina 69 years earlier. It was 1994, I was sitting out in front of the house of my mothers birth home in Tihaljina, holding my grandfathers folded hands (Oh how I loved those soft, wrinkled hands) telling me how he wept as a 30 yr old soldier when word spread to their village about the 12 tortured franciscans. He kept repeating the words “Pobili su pratre, pobiše nam pratre”. When he spoke to me about it, his eyes welled up with tears, his tired face telling me a story that took me back to that bloody day in Široki Brijeg. February 7, 1945 was a horrific day for the Croatian Catholic population. 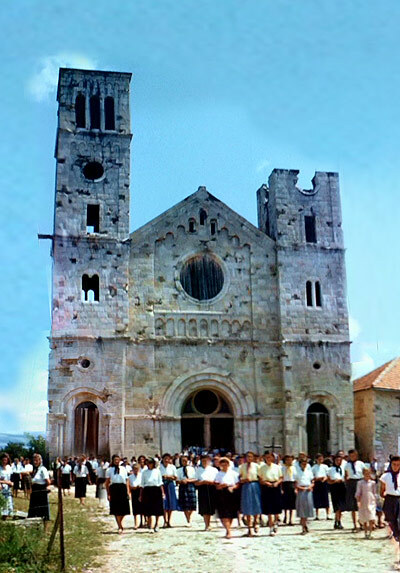 Hercegovina, a poor region that was built on faith and patriotism, was deeply rocked with the news that 12 franciscan priests were killed by communists who wanted to abolish anything and everything Croatian and Catholic. The communists came to the monestary and said “Remove your habit.” And the priests responded “We cannot. I am my habit.” A soldier threw the crucifix at the feet of the Franciscans and said “Now you can choose. You can choose death or life.” One by one, they picked up the crucifix, embraced Jesus and said “You are my God and my all.” Not even thirty meters from this front door, they were burned. Gasoline was poured over them and they were set on fire. Shortly after, the church, seminary, religious and cultural artifacts over 800 years old were destroyed, in an attempt to liquidate everything Croatian and Catholic in that area. 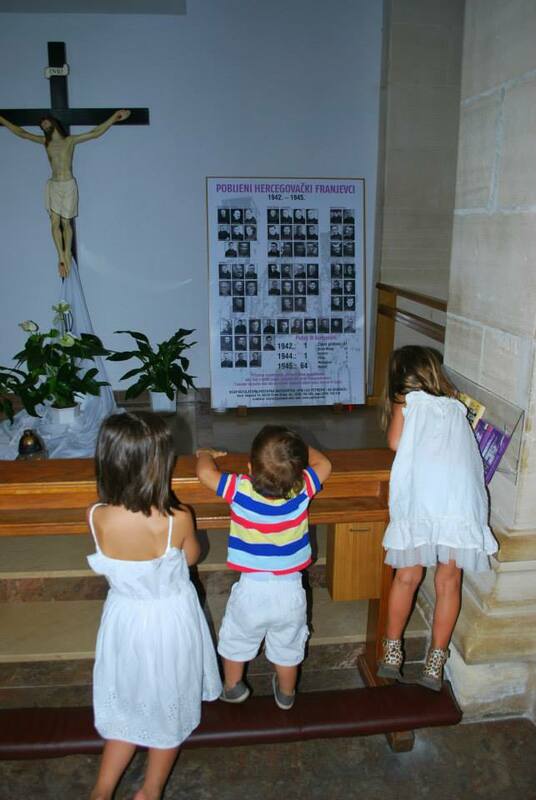 In the years following WWII, the communists tried to separate children from their national identity and their faith. The area was systematically economically neglected, with the aim of having as many people as possible leave the area. The more the Communists tried to squash all their religious practices, the more devout these people were. 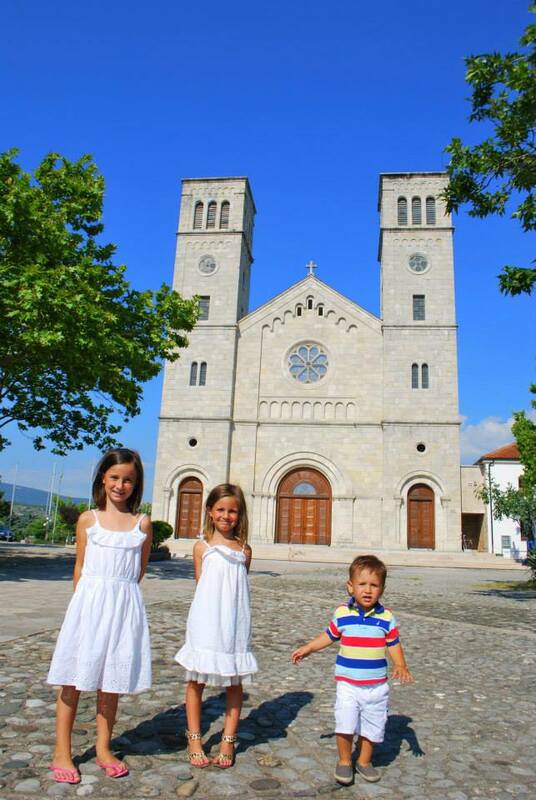 Where a Catholic church seems to be dying in the rest of the world, it is thriving in current day Hercegovina. 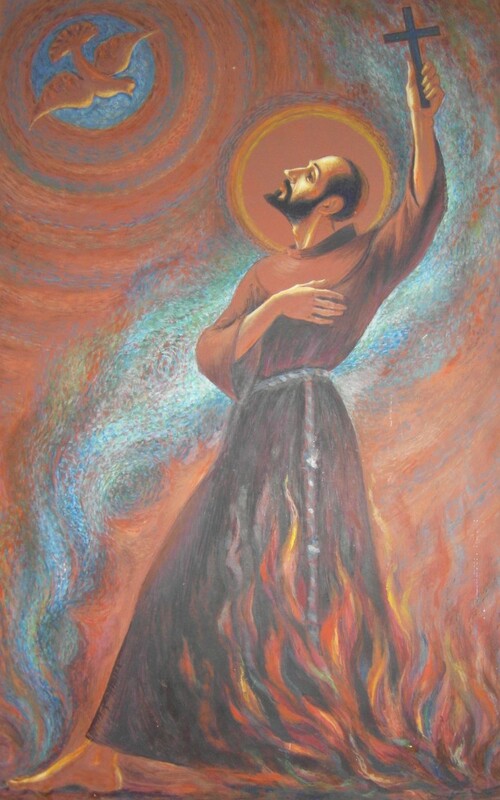 Many young men follow the footsteps of these franciscans and join the priesthood, youth organizations throughout Bosna and Hercegovina and Croatia bear the name “Franciscan youth” (Franjevačka Mladež – FRAMA), and every household lives their faith. 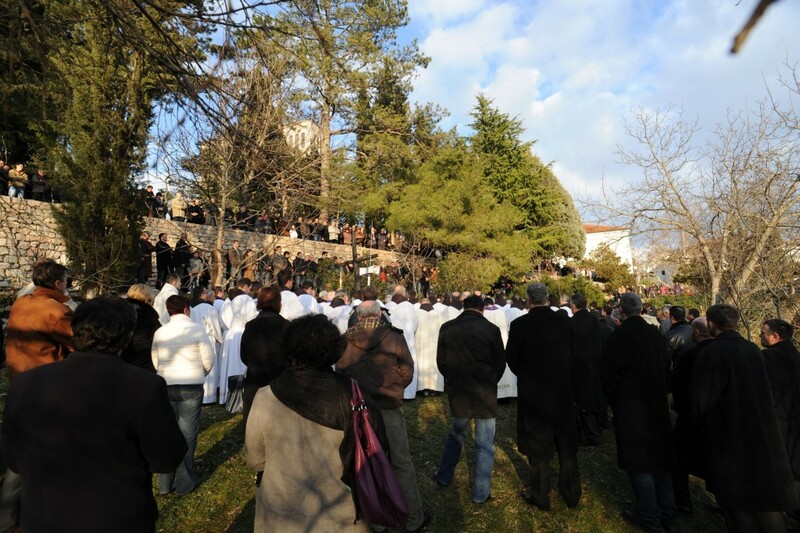 February is a sombre month in Hercegovina, particulary in Široki Brijeg. Out of the 66 priests that were killed, only 33 of their remains were recovered, as recently as July 2013. Every year, vigils and masses are held at the site of tortures, and at the known graves. Široki Brijeg holds a special place in my heart. My husband and I were married in this church, and we bring our children here every summer to pray and light candles in honor of the martydom of the franciscans. We take them to the entrance of the cave where the franciscans were burned, and we tell them the truth – nothing is sugar coated. We hope they will one day understand that these franciscans, and many of their ancestors died brutally, so that they may enjoy the freedom of visiting their homeland. Dobro je Brale, baš dobro napisano- svaka čast! It is so very important that our children know the fate, the terrible fate served unto their ancestors by totalitarian regime of communism. Well done for doing what you do, Didi! Thank you Ina! It is very important that my children and all children know the horrible history behind Croatia’s independence! Hvala! This is wonderful. It is important for our children to understand! Thanks for all the time you put into this. Thank you Margita for your kind words, and thank you for reading! Do you know Darko Peric of Toronto?